The murders of Jasmine Collins, Tamara Dominguez and Dionte Greene put Kansas City's LGBTQ communities in a state of crisis. 3 LGBTQ homicides, also of people of color, have now occurred in the past year. While reaching out to support the partner and chosen family of Tamara Dominguez, The Kansas City Anti-Violence Project, Una Lucha KC, The Justice Project and One Struggle KC are shocked and devastated to learn of the homicide of Jasmine Collins, another transgender woman of color, who was murdered earlier this summer in Kansas City. Jasmine's murder increases the national count of transgender women killed by violence to at least 18 this year. Jasmine Collins, a 33-year-old Black transgender woman, was murdered on June 23, 2015, in a parking lot of a local motel. One suspect, Tia Townsel, has been arrested and charged for 2nd degree murder and armed criminal action. Despite occurring about two months ago, Jasmine's death is only now being added to the total number of transgender women murdered this year because she was misgendered by both law enforcement and local media that portrayed her as a man. As shared in The Guardian, her friends and loved ones initially assumed Jasmine had left town, only to be stunned when learning that she actually had been killed. Inaccurate police and media reports contributed to the erasure of her identities and caused her to be invisible. Last Monday, August 17, 2015, Tamara Dominguez, a 36-year-old Latina transgender woman, was murdered near Independence Avenue and Spruce Street. Tamara was intentionally run over three times by a large vehicle, sending a threatening, direct message of hate towards other trans-women and LGBTQ Latin@ communities in Kansas City. Our organizations are working collectively to help support and advocate with Tamara's chosen family and friends. Tamara was loved and cherished by her chosen family. She is survived by her partner of six years and her four dogs -- Luna, Travis, Sensei and Arigato. Her partner shared, "She was happy with who she was and it didn't matter what her family told her." She was cherished for her smile, laughed always and was overall known as a sweet, gentle and generous person. Tamara was a beloved cook and her partner and chosen family loved her shrimp ceviche and empanadas. Her close friends shared, "they want the focus on who did this, not her being transgender." Kansas City's Black LGBTQ communities are still grieving from the loss of Dionte Greene, a 22-year-old Black gay man, who was murdered on October 31, 2014, near 69th Street and Bellefontaine Avenue in Kansas City, Missouri. Dionte's body was found in his car with the engine running. Many members of our LGBTQ community still believe his murder to be hate-motivated despite it not being prosecuted as such. Two suspects have been charged with his murder: Travone Shaw, 19, faces charges of 2nd degree murder, 1st degree robbery and two counts of armed criminal action. Antonio Golston, 21, faces charges of 2nd degree murder and in the alternative 2nd degree felony murder, 1st degree robbery and two counts of armed criminal action. Both have pre-trial this Thursday, August 27, 2015. Dionte Greene, also known as Le'Vion Cavalli, was a child of the House of Cavalli, a humble young man, local performer, title holder and a rising star in the Kansas City voguing and ball scene. He was a member of the KC Falcons Drill Team and well recognized as an emerging leader in the Black LGBTQ community. Dionte was also a loving father of two 8-year-old twins. 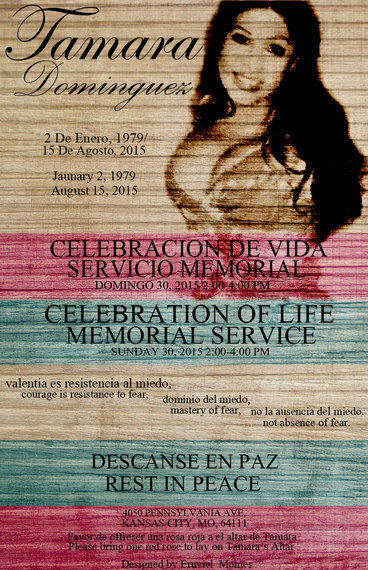 The Kansas City Anti-Violence Project, Una Lucha KC and The Justice Project will be hosting a "Celebration of Life and Memorial Service for Tamara Dominguez" this Sunday, August 30, 2015 from 2-4 pm at 4050 Pennsylvania Ave., Kansas City, Missouri 64111. This service is open to public and media. The family requests that anyone attending the service bring at least one red rose with them to lay on Tamara's altar. Following the memorial service, The Kansas City Anti-Violence Project, Una Lucha KC and The Justice Project will also host a "Community Healing Event for KC's LGBTQ Communities" on Sunday, August 30th, from 5-8 pm at 4050 Pennsylvania Ave., Kansas City, MO 64111, which is open to those who self-identify as LGBTQ. This event will be closed to media and free of law enforcement. The event intends to provide a space where LGBTQ people can process Jasmine, Tamara and Dionte's murders, as well as address both the immediate and ongoing trauma our communities are carrying. This event will provide our LGBTQ communities with an opportunity for collective healing and will include various individuals with experience responding to trauma and grief, including advocates, religious leaders and therapists. There will be a large room solely for discussion among attendees with trauma-informed facilitators, while a separate safe space will be designated for trans women of color, who have been most impacted by this violence. We also plan to have other group and individual activities at the event so people can process and heal in ways that feels best to them. It is necessary to begin healing and community response in Kansas City. Our LGBTQ people are experiencing violence on a regular basis and our communities desperately needs to address divisions within. There has been increased media attention nationwide focusing on the death of trans women of color, but we lack a community response to the violence itself. This community healing event is essential. Kansas City is prepared to be a leader in this movement based on Kansa City Anti-Violence Project's continued dedication to engage our diverse LGBTQ communities, which was exemplified through us hosting a previous series of three townhalls and documentary videos in 2015 focused on "Racism in LGBTQ Communities," "Access to Safety in Spaces," and "LGBTQ Experiences with Law Enforcement." During the town halls, KCAVP had over 250 people attend and learned that our communities need tangible next steps for keeping our most vulnerable people in the city safe and free of violence. Attend "Tamara Dominguez's Celebration of Life and Memorial Service" this Sunday, August 30th, from 2-4 pm. Anyone attending the service should bring at least one red rose with them to lay on Tamara's altar. Donations will be collected for her chosen family. For those who self-identify as lesbian, gay, bisexual, transgender, queer (LGBTQ), attend the "Community Healing Event for KC's LGBTQ Communities" on Sunday, August 30th, from 5-8 pm. This event is closed to the media and free of law enforcement. Donate to support Tamara's chosen family through their GoFundMe page. Anyone who identifies as Transgender or LGBQ, and is experiencing grief due to one or multiple of these brutal murders is encouraged to reach out to KCAVP for free support and advocacy services. Help is available by calling 816-561-0550 or emailing info@kcavp.org.